Zucchini seems to be a thing in Alaska. According to the author of the cookbook I purchased for this stop on my vicarious food adventures, What Real Alaskans Eat: Not Your Ordinary Cookbook (aff), zucchini is crop that grows easily in Alaska during summer months, as rhubarb is, and is often produced in gardens at such quantity that people have to really stretch their imaginations when it comes to using all the zucchini grown. I’m a fan of the only zucchini bread I’d tried before baking this bread, which was the extremely moist, cake-like coffee-shop zucchini bread at one of my favorite local coffee shops, the Thinking Cup in Boston, so I eagerly dived into this recipe when I saw that I, too, could make this delicious creation during my time in Alaska. I was also delighted at the prospect of sneaking more vegetables into my diet. This bread was less of a sweet cake than the version I adore at Thinking Cup (I wonder how much worse for you it is, if at all? ), and definitely heartier. Good on its own with some butter—I didn’t feel that jam would pair well with it, nor did this bread seem like it would pair well as a sandwich bread. It’s a hearty solo act. Still reading Michener’s Alaska, Everyone. It’s pretty funny: I downloaded the ebook, having no clue as to Michener’s reputation (not that this would have changed my decision to read Alaska). After opening the ebook and reading a few pages, I decided to see how many pages there would be, and was shocked. See, that’s one of the pitfalls of ebooks—you can’t tell their length immediately. I’m actually really enjoying the book, and I think I made the right choice to base the length of time in a place based on however long it takes me to get through a book about that place. My goal for this project wasn’t just to learn to cook foods from around the world and enjoy them, but also to really learn about the random places I landed in, and I can think of no better way to do that than to read about each one. The downside, of course, is that if I choose to read an epic novel like this one, I’ll be in one place for some time, and things will slow down on the blog. I still like reading about each place though, so I’ll keep tweaking it until I find a middle-ground solution that works. Any suggestions? Speaking of suggestions, I’m also searching for an interesting book about Upper Michigan (or just Michigan), my next vicarious location. Non-fiction, memoir, biography, and historical fiction are genres I enjoy that also allow me to learn about the place. Any recommendations? In search for more Alaskan recipes, I purchased this cookbook What Real Alaskans Eat: Not Your Ordinary Cookbook (aff). It focuses on pre-pipeline Alaskan recipes, emphasizing the dishes the Americans brought over as well as some modern and original versions of classics. So far, it’s been enjoyable, and the author writes with a dry sense of humor, which I also enjoy. The recipe also called for beer, and, since Alaskan beers aren’t sold at the local liquor store, I decided to try Morph, a beer from the local Night Shift Brewing Company in Everett, Massachusetts. I admit I was swayed by the owl on the can, but this not only went really well with the chili but also has become a favorite beer of mine. What’s cool about it is that the company never brews it exactly the same way twice, resulting in slightly different flavors each time. I liked it a lot. That said, I probably went overboard with the bacon (I added more than the recipe called for), as the final dish was quite heavy. Then again, had I used less bacon it might have been perfect for a main course, but I’d recommend this one served as a side with blue corn tortilla chips and topped with dried, sweetened cranberries. I had never heard of ptarmigan before researching Alaskan foods. This bird is a food source up north, but given the geographic limitations of my kitchen project, and the endorsement of the author of the recipe for ptarmigan that chicken drumsticks taste quite similar, I decided to make chicken drummies in lieu of the slightly dove-looking bird. For this meal, I combined three recipes from the cookbook I purchased for mostly pre-pipeline (but some more adventurous, post-pipeline) Alaskan dishes, What Real Alaskans Eat: Not Your Ordinary Cookbook (aff): ptarmigan, cranberry salsa, and stir-fried barley. I had trouble imagining this dish—I had guessed it would be disgusting, potentially, or actually excellent, but I didn’t think it would end up in the “very good, but not worth the calories” camp. I love salmon and I love pies, and salmon and brown rice is always good. But cabbage, mushrooms, and vinegar? Actually, that part came out pretty tasty, too. I used this recipe for the puffed pastry—I made my own to avoid hydrogenated oils in the store-bought kind, but, man, the homemade kind comes out so much better anyway. (Just for reference if you want to try it and you’re an American reader— roughly two cups of flour is about the same as 250 grams). Although the crust was supreme, I think the best thing I’ve gotten out of that recipe is the rolling pin technique for pie crusts—which is to start at one end and just keep rolling the whole thing out that way. I’ve never been able to get a dough as thin as this one previously. Alaska and Reading Alaska: A New Timetable Strategy? March 15, 2015/ by A. Alexander/ in Alaska, Bristol Bay, North America, USA/ Comments Off on Alaska and Reading Alaska: A New Timetable Strategy? At least for Alaska, I’ve decided to go ahead and keep making Alaskan dishes until I’m done with the novel Alaska. We’ll see how that works. The two-week plan has its benefits—I can plan ahead, for example, with holidays I might be making special desserts or meals for. Then again, not being sure where I’ll be when is a little more exciting in a way, leaving an element of suspense to the project. So, which do you think is a better plan? Switching locations every couple of weeks or changing locations whenever I’m finished reading a book about that place? Dillingham, Alaska: I thought I knew a lot about the United States, but when I investigated this little town on an inlet in Bristol Bay, I was surprised by just how remote the area is. It’s isolated from any other towns and cities—there are no inbound nor outbound roads, and the only way to get to the area is by plane or by boat. The town has no movie theaters, and it only has nine restaurants (two of which are seasonal) and three stores. Churches, however, are in moderate abundance. The area has only been known as Dillingham since after 1903, when a post office was built and named after Senator Dillingham from Vermont (his subcommittee had investigated the 1898 Gold Rush, but he’d never actually been to Bristol Bay.) Curyuk, or Curyung is the location’s name in the language of the original residents: the Yup’ik (not to be confused with the Siberian Yupik ). Explorers referred to them as Eskimos, and many Yup’ik people now self-identify with the term. In Curyuk, or Dillingham, the Bristol bay sub-dialect of the Central Alaskan Yup’ik language is used. The Yup’ik language sounds relaxed with an even cadence, and its alphabet has guttural sounds similar to those of French and Arabic. An area of Curyung even boasts the world’s longest palindrome for a geographic name: Kanakanak, meaning “many noses”—a reminder of the 1918-1919 influenza. One Yup’ik cultural icon appears to be a variety of traditional dance masks, some of which had designs that looked surprisingly modern, as if Pixar or Miyazaki had designed them. This one is supposed to represent the wind maker—the top controlling the winter winds, and the bottom, the summer ones. 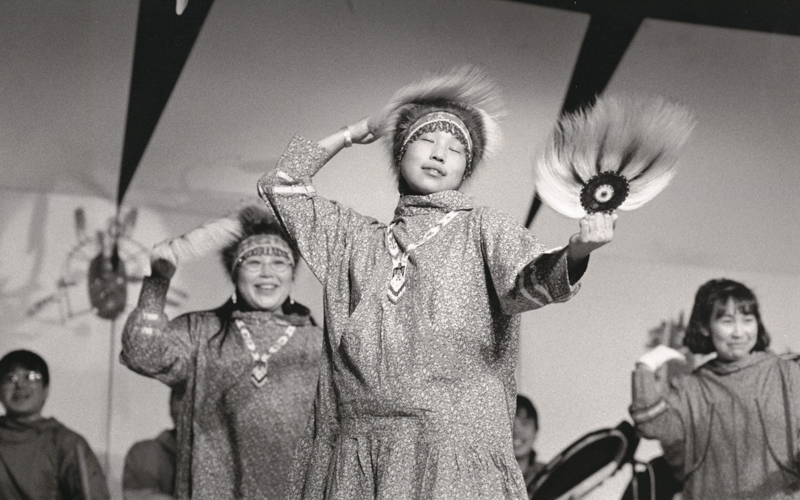 The tribe even has “finger masks“—mask-like, decorative rings worn while dancing. While searching for relevant regional reading material, I found James Michners’ novel Alaska. It’s about 1, 300 pages, but I hope to finish it within the next couple of weeks by reading about 100 pages a day. It’s so good! It’s been a great experience learning about Swabian culture, and I’ve learned a lot. My favorite recipe that I tried, though, was this one for spätzle. The dominant flavors of this thick, hearty pasta were nutmeg and white pepper, although there are a few varieties different from the one I made. This dish fills you up quick, so it’s best served in small portions or as a side dish. These large ravioli-like dumplings are called Herrgottsbecheißerle, meaning “God’s little bullshitters,” in the Swabian dialect of German. The dish is rumored to have been developed by devious monks who thought they could hide meat under the dough so God wouldn’t see them eating it during Lent. Personally, I find it hard to believe that sincerely religious monks would actually believe that an omnipresent deity would be fooled by meat hidden in dumplings, and much more likely that whoever created this dish may have been a non-believer in a religious era trying to hide the meat from casual onlookers…but who knows. Anyway, it’s perfect that I was able to make these right after Fasnet. Today I tried this recipe for flädle uberbacken, a sweet pancake dish that’s baked with applesauce, raisins, and almonds, but with my own modifications. The supermarket had run out of plain applesauce, so I used cinnamon applesauce. I had run out of white flour, but I still had spelt flour (which is also a Swabian ingredient) so I substituted the last 1/4th cup of white flour for spelt flour. Instead of milk, I used vanilla-flavored almond milk for a dairy-free version.